Disclaimer: This post contains Amazon and Target affiliate links, where we may get a commission if you make a purchase after clicking. This doesn’t raise the price of anything, so enjoy! It has been a few weeks since I have done a child product review. 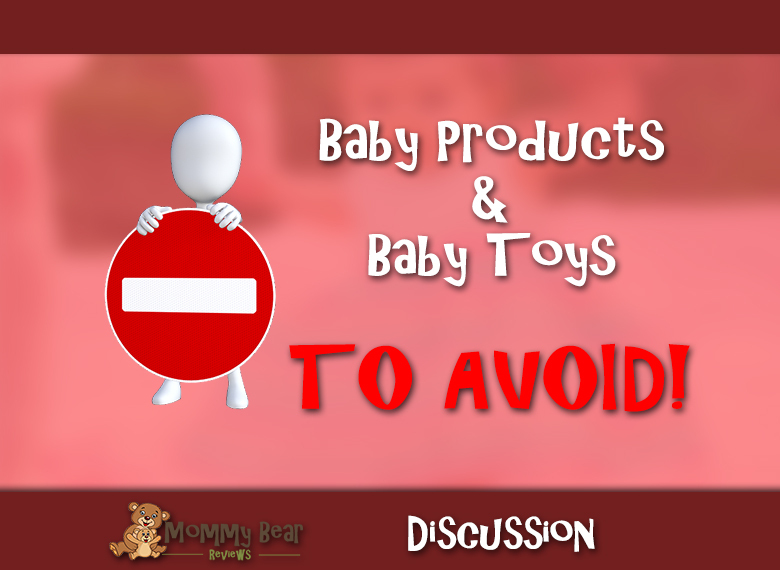 As I hope that you have stayed up-to-date on my blog and would know, I do not have a lot of negative reviews on the blog because there are a lot of great products for children that I get excited about and want to review. Unfortunately, I do have a negative review for you, as is bound to happen. I am writing a review today for the 3 Size Stay Put Spill Proof Stackable To Go Snacks & Storage. We ordered this off of Amazon because our little cub has been getting slowly more self-sufficient, with slowly but surely learning to feed herself more and more. 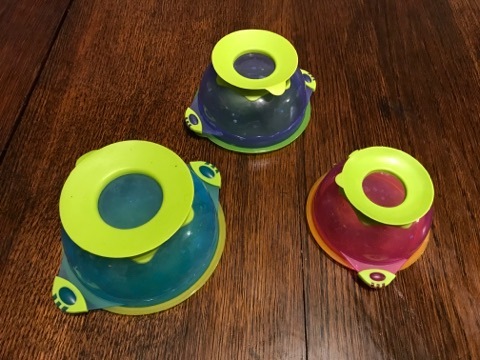 We thought having bowls that will stick to the table with a suction cup would help keep things a little less on the floor as happens as our little ones learn to do things such as eat more on their own. Unfortunately, we were not very impressed. I will give the positives: the lids that come with them work fine and it is convenient that they are microwaveable but that is really about it. First of all, which was partly our own faults for not doing any further research, they are $16.95. They have a 3 pack Munchkin bowl set just like this (minus lids) at Target for $7.99. Granted, the Munchkin bowls were given 3 stars, and the bowls that I am reviewing was given 4 ½, and let me just tell you I don’t know how in the world that happened. I haven’t tested the Munchkin bowls, but at least the price point is easier to swallow. 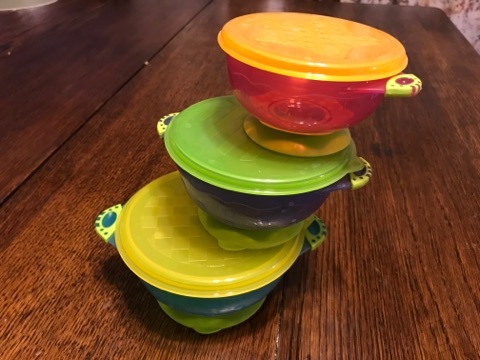 Yes we still have some microwaveable bowls for our daughter to use, but the whole point of these bowls were to have the convenience of suction cups! They maybe worked half-way one or two times, and then they give out and the suction doesn’t seem to work anymore. Having gotten 4 ½ stars is beyond my belief, the best that I can give these bowls is 2 ½ stars. Maybe these kind of bowls, while a good idea, just do not hold up very well to the idea behind them. I have yet to try other brands. 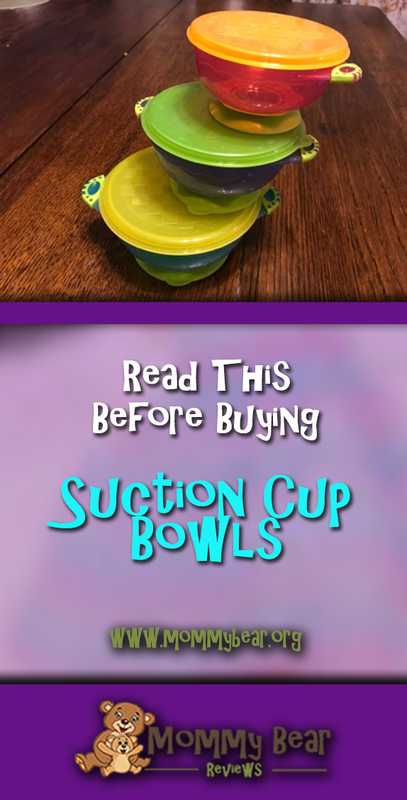 However, my recommendation if you want to try out these suction cup bowls, 1st try a different brand and one that is cheaper so you are at least getting more of your money’s worth in case none of the suction bowls really work. 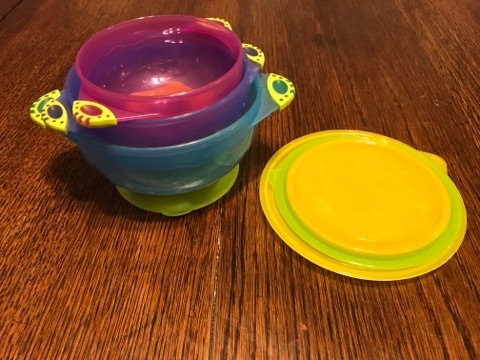 Do any of you mommies out there have a different experience with these bowls? Is there a different brand that you are impressed with that work well? Please inform me and other mommies down in the comments below! Like always, thank you for reading and supporting my blog! Share with your friends and please like, and follow Mommy Bear Reviews on Facebook, Instagram, Twitter and Pinterest. Try a different brand. When my son was a baby(now 4 yrs old) we had something similar to these and it was ridiculously hard to get off of his high chair and even stuck to the sink when being washed. Oh! Do you know what brand you used? I’d love to find out, because this seems like the best solution, but these just didn’t work for us. Do you know if they also stick to wood? We have our little cub in a booster seat and she eats at the table most of the time now, so we would have a wooden surface.